Headboard Custom World Map Canvas Ready to Hang - Canvas Wrap - Choose Size. World Map + Countries and their Capitals + USA and CANADA STATES and Capital States. 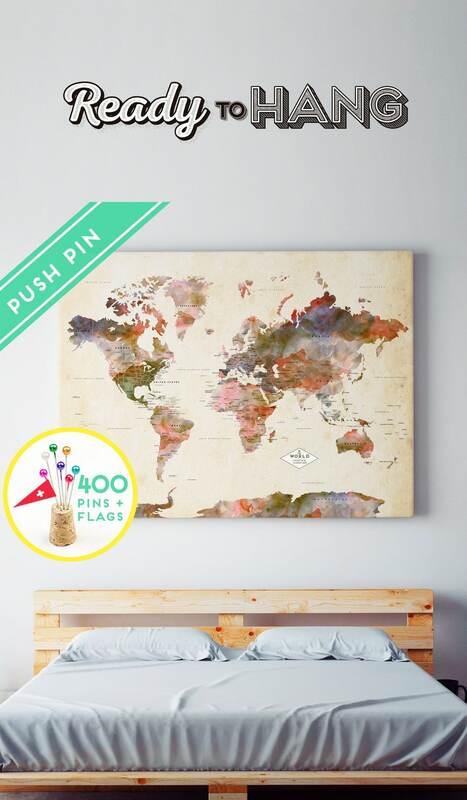 Track your travels with the push pins and planning your next adventures! It's the perfect gift for Anniversary, Birthday, Wedding, Housewarming,...and for children to have fun learning geography. The CANVAS is hand stretched, ready to Hang and Pin it! • Select SIZE & FINISH in scroll menu. Here you can choose the option of the mounted canvas, or the canvas mounted with the floating frame. In both cases the canvas finish is perfect and ready to hang. • Add your custom quote and font choice during the purchase below the "Size & Finish" drop menu. Finish to order, please just click "Add to Cart" button at the top of the page and proceed to the checkout. • We will prepare and send a digital proof, you will receive to your Etsy email within 48 hours. You can make the necessary CHANGES AS YOU LIKE. • Once the proof it's ok, we will prepare the map for production. - Oh, the places we will go! - You are my greatest adventure. - A lifetime of adventures. - I can show you the world. - Not all who those who wander are lost. - The World is a book and those who do not travel read only a page. - Vacations and friends are the two best things in life. - Wherever you go, I will go. - Wherever the Lord leads, We will follow. - Life takes us to unexpected places, love guides us home. during checkout and we will include your gift message. We ship all across the world, ALL orders are now shipped Express Mail. • Please note your World Map order will be shipped to your ETSY address. If you have a different shipping address, please include that information in the “Note to Seller” section during check out. We ship all across the world but please read our shop Policies to know our Shipping dates. 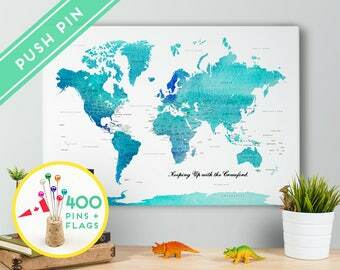 World Map Push Pin CANVAS - Personalized Gift Idea - Watercolor Blue Countries - Housewarming Gift - 240 Pins + 198 Flags of the World. 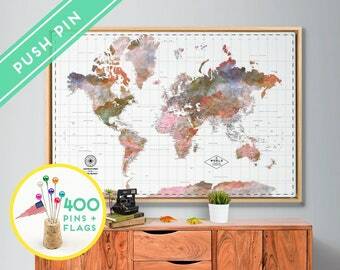 Travel Gifts World Map Push Pin CANVAS ,Personalized Gift Idea, Best gifts, Holiday sale, Outdoor gifts - 240 Pins + 198 Flags of the World. The map was a wedding gift for a couple, and they loved it! Anabel from Macanaz was extremely available and kept promptly in touch for the customisation of the item and for the expedition timing, and it arrived just in time despite the order being placed few days before. It’s beautiful. Exactly what we needed for our wedding. In the case of a full refund after receiving the order, it is necessary to send us the item before making the refund. Buyers are responsible for return shipping costs. Delivery will be done after confirmation of payment order. Once an order is placed (and paid), in the next 24/48h we send the proof of your order. If the order includes a custom design (change the original color of the skyline, create custom stickers, ...) the proof may take 2/3 days to prepare. If you need the item to be shipped in a faster way, please include the UPS ad to change your shipping from standard to Express. To avoid delays in deliveries, we ask our customers a contact number. DHL will call the day of delivery, to ensure that there will be someone to pick up the package. When I will receive my proof after the purchase? After placing your order, we will send you the proof in the coming 24h (This can takes 48h during the weekend). How long does it take to send the order to my country? IMPORTANT! If you only purchase our PENS/Stickers or Push Pin Sticker Set, this are shipped with Correos -Spanish Postal Service - delivery time can take 2-3 weeks. 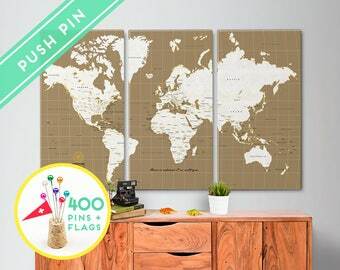 World Map Push Pin Canvas Personalized - 3 Panels world map - Ready to Hang - Industrial Decor - Pins + Flags FREE SHIPPING! !